DISCLAIMER WINE ON MACOS DOES NOT SUPPORT DIRECTX10/DIRECTX11/DIRECTX12! I CAN NOT SUPPORT WHAT WINE DOES NOT SUPPORT!!!!!!! Kill Wineskin Processes should kill ALL Wineskin processes. Disables X11 option if XQuartz is not installed. The Windows EXE should use Wineskin syntax, including the drive and the flags, (eg. "C:/Program Files/temp.exe" --run) instead of using a macOS reference path (eg. /Program Files/temp.exe) and the flag apart (eg. --run). Integrated fntoggle directly into Wineskin.app, now you can have Standard F keys during wrapper usage. Wine versions not compatible with "mac driver" will have that option disabled. Fixed a long standing bug from official Wineskin "Command Line Wine Test" now works as intended. No longer alters "EXE Flags" meaning if you require a "/" it's no longer changed to a "\"
Many fixes when dealing with newest engines. Closes XQuartz on exit if used. gnuTLS included so supported engines can use it, aka using WineCX17.5.1 Steam will download again. Downloads engines hosted on WineskinServer. Directly download current "Unofficial Master Wrapper Version"
Wine versions that Require XQuartz to function are hidden by default. Correctly handles wine version string for repacking. With a minimum requirement of macOS/OSX 10.8. With a recommended requirement of macOS/OSX 10.9. Don't use keka to unpack as it currently breaks any downloaded applications after unpacking! This feature was added so winery.app can read a local EngineList.txt file, create a text file with that name in the save directory as winery.app this will now override the copy hosted on GitHub , follow the correct Wineskin engine naming style to download Wine to be repacked into Engines. Please make sure to clear out your users /tmp folder if you have any issues creating wrappers. Anyone who uses PortingKit and is running OS X10.8 to 10.14 is now using Unofficial. VitorMM - For the modernized code base along with all the included features! Great work! I think the best thing about the update is the fact that gpu detection is now disabled by default. I feel like a lot of people unaware of the simple fix to get wrappers working again on High Sierra. But that is not the case, the GPU detection is just fixed (Apple screwed something up with Intel cards in HS), if its unable to detect the gpu its defaulted to Intel since that's what Apple screwed up. Default setting changed was Mac Driver and all the new libs so 64bit Engines and Staging engines just work when built without editing anything. I was messing with Winey but Xcode 9.3 gave up and now crashes for no reason, I might build a VM and see if I can get Winey correctly redirected to another host. Was this during wrapper creation? If it was try to run wineskin-2.6.2 once to give it permission to run on your system, don't make any changes just make sure you can launch it. I have have my system to set to run "applications from anywhere"
No, after creation finished. I have my permissions set to the next higher level, but you can usually bypass if you right-click on it and select 'open'. If it does work cleanly otherwise, maybe doh123 can adopt and sign it as 2.6.3? I used terminal command to enable the lowest option to allow apps from anywhere, ages ago since I use other software that are not signed, the right click open trick does not always work since it core app calls other unsigned binaries. If it was signed it would work just fine, I remember doh123 said these days they don't have time to work on the project and since the GPU fix was submitted 2017-10-03 I'm not sure when doh123 will be back again. If you want I could explain how to get most of it working without even updating the base wrapper so it auto disables the GPU check and also defaults to MAC Driver, then just add the updated Framework Folder since those are all signed. Edited by Gcenx, 03 April 2018 - 07:13 PM. Ok, it works now, great Thanks for spotting the missing folder! Thanks for catching it and posting feedback. Oh...hahaa, kind of funny I guess. I must have disabled it out of habit I suppose, without realizing. I thought it was actually disabled. So GPU detection now works on High Sierra again? Yep GPU detection is working again on High Sierra with this. Ever noticed that wine64 wrappers don't show the wrapper name instead it's just wine64? I'm currently testing out a fix for this little issue. This change also does not affect 32bit builds so it's still universal. Added symlink for Downloads folder and added control to Wineskin interface also testing a fix for "Kill Wineskin Processes" since it never worked right when using "MAC Driver"
"Kill Wineskin Processes" works but to work it has to force close anything related to wine/wine64/Windows, so other Wine/wrappers/applications would be affected by this. Since no one ever mentioned "Kill Wineskin Processes" not working, I guess its not used much. Edited by Gcenx, 06 April 2018 - 06:58 PM. Thanks Gcenx! Did you update the download at the top of this thread? Edit: never mind, you did. I haven't used the 'kill Wineskin processes' button in forever because it didn't work for me some time ago and now I just use the application monitor. It would be nice if it worked again, and i don't mind if it kills of other Wine stuff. I only run one at a time. Yeah I noticed since I now only use MAC Driver that it no longer worked and like you I had to keep "Activity Monitor" open all the time to make sure I could kill everything, wouldnt be the first time I remade wrappers over not noticing processes were still open that caused the install problems to begin with. For the fix just use 2.6.4 it will kill anything wine/wine64 related processes, I know it's overkill but I tried other ways to kill everything just inside the wrapper but no luck but since this way works I guess it's fine. This includes the GPU detection fix by "Markus Stoll" merge request on sourceforge. I've reported that a long time ago, but still didn't had the chance to publish the modified Wineskin, although it's ready (however, not tested). Just remembering: my source requires my framework, ObjectiveC_Extension, to be build. That's easy to do with Terminal commands. Let me look over you version some more and I will do a pull request with the changes, I got the idea already from your updated code. Seems you have detection built in for what type of engine you try to install nice, for Staging64bit engines they don't like redirection of libs or it won't create syswow64 or program files (64bit) correctly. nice, for Staging64bit engines they don't like redirection of libs or it won't create syswow64 or program files (64bit) correctly. Glad to see somebody continues the great project. If anyone has issues creating new wrappers please empty your /tmp folder, that should solve your issues. Also do not make Staging 64bit wrappers as it could leave junk behind in your /tmp folder. As you can see below wine/wine64 are happy with them and you can see I do not have XQuartz installed on my system so wine/wine64 are using the libs provided in frameworks. The two missing libs are by default missing when using normal WineHQ installs. 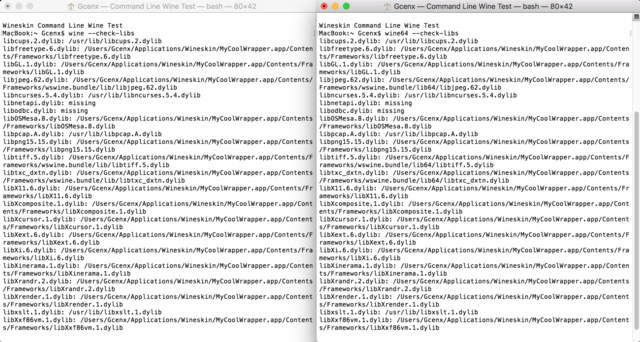 A few libs included with Slice's update6 were giving me errors about version mismatches or just out right ignoring them, these are read fine by --check-libs and I no-longer see errors about wrong version of libs when checking wine run logs. Cool, thanks! So the links in the top post are now updated? The files are dated recently, but I couldn't be sure. No need to update the link, I directly linked to the folder on MEGA where I'm keeping the files so I can't forget to update the links anymore. Renaming also restored and improved, the new upload will rename wine/wine64/wine-preloader-wine64-preloader as needed depending on the engine used. This is done by directly checking inside wswine/bundle/bin then does the correct naming, this solves the problem of Staging & Staging64 wrappers not always building correctly due to wine/wine64 being renamed will break them. Instead for Staging & Staging64 the wine-preloader/wine64-preloader are renamed, since those are the used processes. I successfully made a wrapper using the Staging 64 Fix version of your wrapper and Wine Staging 3.6, but then it hangs when I open Wineskin. Also don't forget since it's downloaded software and not signed you will need to give whitelist it to run on yourself. Okay, I've installed the new wrapper, cleared the tmp folder*, and made a new wrapper. Wineskin is still hanging, unfortunately. *Open the hard drive, hit command+shift+period to reveal hidden files, open the tmp folder/alias, move everything to the trash. Right? Clear it out, you might find temp files from Wineskin/wrappers. I don't know if your wrapper ever really got created I still think its also because didn't give it permission, so I made a Staging3.6 wrapper compressed as dmg image and added the folder that contains the wrapper update. Try to use that instead I guess since its working on my system and also working on another install on a USB hard drive that's a clean install. I downloaded your dmg and Wineskin now runs fine! Thank you!